The National Endowment for the Arts has awarded the Grand Rapids Symphony a $10,000 grant for its annual “Symphony with Soul” concert and gala. Three-time Grammy Award winning singer Lalah Hathaway, who is nominated for two more awards at the 59th annual Grammy Awards, will be special guest for the 16th annual “Symphony with Soul” in February in DeVos Performance Hall. The Grand Rapids Symphony’s award is its third consecutive grant in six years through the NEA’s biennial Challenge America program, which supports projects that extend the reach of the arts to those with limited opportunities due to economics, disability, ethnicity or geography. In 2002, the Grand Rapids Symphony created “Symphony with Soul” to open its doors to the wider community. The concert and its accompanying “Celebration of Soul” gala have grown to become an important annual event in Grand Rapids. Principal Pops Conductor Bob Bernhardt leads the next “Symphony with Soul” on Saturday, Feb. 18, 2017. Tickets start at $18 or $5 for students. Along with Hathaway, the one-night only show features the Grand Rapids Community Chorus organized by Duane Davis, retired director of vocal music at Grand Rapids Community College. At the “Celebration of Soul” dinner preceding the concert, the Dr. MaLinda P. Sapp Legacy Awards are given to honor individuals and organization for their on-going efforts for diversity and inclusion. The award launched in 2006 laster was named in memory of MaLinda Sapp, co-pastor of Lighthouse Full Life Center Church in Grand Rapids, who died in September 2010 of colon cancer. 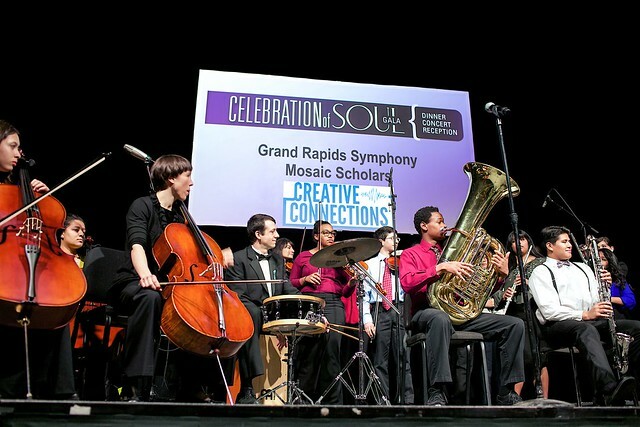 Proceeds from “Symphony with Soul” and its accompanying “Celebration of Soul” gala help support the Mosaic Scholarship Fund, which provides training on musical instruments and mentoring by professional musicians of the Grand Rapids Symphony. The Mosaic Scholarships were created in 2005 with a grant from the W.K. Kellogg Foundation. The National Endowment for the Arts in December awarded more than $30 million to nonprofit arts organizations in 48 states for 2017. Grand Rapids Symphony is the only orchestra in Michigan and one of only two organizations in Grand Rapids among the 21 grants totaling $445,000 for the Great Lake State.